If you are unable to access the Control Panel Site, it would most likely mean that your computer has a Firewall Software installed or the cookies setting is incorrect in web browser setting. In order to view the Control Panel Site, you could do one of two things. Scenario 1: If you CANNOT see the login screen at all, the web browser reports that "the page not found" or "host not found". 1. Right click on the Firewall Software icon. This icon is usually found on the right hand side of the Windows' Taskbar. Firewall icons are usually a logo of the Firewall Software Company, so not all Firewall icons look alike. If you do not know what the icon looks like, just direct the mouse to all the icons you see on the right hand side of the toolbar and read each description until you see the word Firewall. 2. Once you find the Firewall icon, right click it and look for a phrase saying "Disable Firewall." Click on that and the Firewall will be automatically disabled. 3. After disabling the Firewall, you are now able to access the Control Panel Site. People install a Firewall Software for obvious reasons, so if you do not wish to disable it, you could change the settings of the Firewall Software to allow Port 8888. Adding TCP port 8888 onto your Firewall settings will enable you to view the Control Panel Site. To change the Firewall settings, you will need to consult with the Firewall Software Manual. Through the manual, you will need to look for a heading regarding "How to Change Firewall Settings" or something along the line of that. Follow the steps written to allow TCP Port 8888. Once that is completed, you are able to access the Control Panel Site. Scenario 2: If you CAN see the login screen, but you cannot login the control panel with your account primary login ID and password. 1. 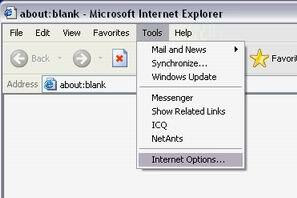 Open Internet Explorer, click on Tools, and then Internet Options at the bottom. 2. Change from General to Privacy. Change your settings to Medium and then click Apply on the bottom to set it. 3. Exit the Internet Options Dialogue Box and try logging in again.